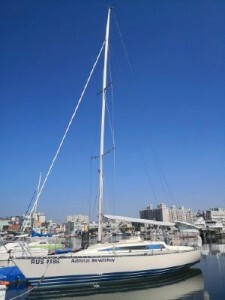 1993 X-Yachts X-372 Sport lying in Pohang, South Korea. The X Yachts X 372 Sport was a great success for X-Yachts, over a period of 5 years, 120 X-372’s were built proving the excellent design and build quality found in these yachts. With accommodation for 6 across two double cabins and two in the saloon, the X-372 is a great family boat that can be also be taken out on the race course. She benefits from a full sail wardrobe from UK Sailmakers, including 1,2,3 Jib, Main, two Spinnakers, storm jib and storm trysail. I bought her in 2018, sailed on her all over the Asia, she is in good condition. All standing rigging changed in 2018 in Osaka, diesel maintenance has been done, all ropes changed in 2017, so they all in good conditions.